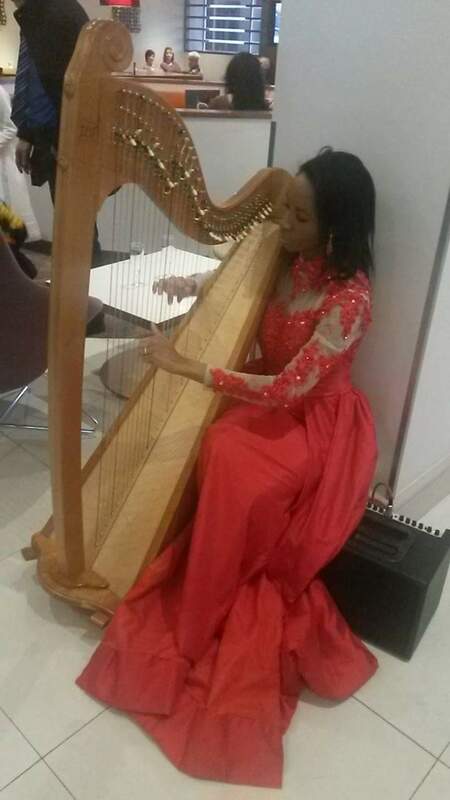 On the 9th of May 2015 I had the privilege of playing my Lever Harp at a friends wedding. This is the story of how it came about! One day in 2014 I decided that I would showcase what I can do and start recording myself on my webcam playing my various instruments and singing too! I thought to myself hmm I have some nice pieces that I have composed on the harp why don’t I share them with the world? Soo… I got the webcam out, put my laptop on it’s stand, got my desk lamp and shone it at me to provide adequate lighting and upped the backlight on the laptop to provide further lighting then I recorded my first video on my birthday! I was sooooooooo nervous I didnt even smile as all energy was diverted from auxiliary functions like smiling to moving my fingers and anticipating the next chord (lol). That seemed to be well received so I made another one. That’s when the bride got in touch, after seeing me on YouTube! The wedding went off without a hitch and they even asked me to play during the cutting of the cake! I had an excellent time and learnt a few things that will definitely streamline the harping process next time.